Extend the growing season of your plants and add excitement to your gardening experience with a greenhouse from KVM. We have quality garden greenhouses available in a variety of shapes, construction techniques, building materials and styles, so it’s easy to choose one that can best match your gardening need. Moreover, with KVM, you can get a greenhouse that is affordable and easy to install, You even have a wide array of choices for garden greenhouse supplies, so you can find exactly what you need for your gardening in one single location. 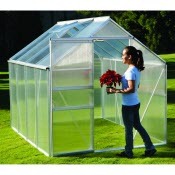 Get a great deal on garden greenhouses and supplies at KVM.